Research is now linking crooked teeth to our epidemic of poor sleep, high blood pressure, cancer, and diabetes, not to mention our appetites, cognitive abilities, and work and school performance. 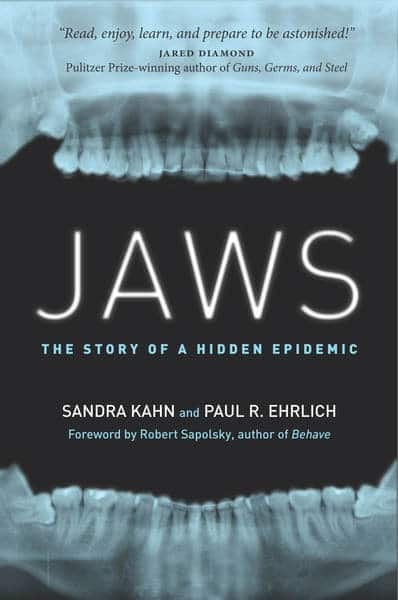 Jaws: The Story of a Hidden Epidemic by Sandra Kahn, D.D.S., M.S.D., and Paul R. Ehrlich, Ph.D., is a breakthrough book that uncovers a serious, mounting public health crisis. one third of children are now afflicted, as well as an increasing number of adults. Symptoms include crowding, impacted wisdom teeth, mouth breathing, and unattractive appearance (small, receding lower jaw, gummy smile). What’s more alarming is that these issues are directly related to snoring and poor sleep, which in turn are linked to serious lifelong health problems including sleep apnea, ADHD, depression, cancer, and heart disease. While teeth can certainly be straightened, what about the underlying causes of this rapid shift in oral evolution and the health risks posed by obstructed airways? Sandra Kahn and Paul R. Ehrlich, a pioneering orthodontist and a world-renowned evolutionist, respectively, reveal why this sudden transformation has happened, along with simple, practical steps that parents can take to ensure their child’s jaw develops in a healthy manner. The book has already received dozens of endorsements from medical professionals, and the authors include approximately 400 endnotes citing the scientific literature supporting their statements. Paul R. Ehrlich, Ph.D., has been a household name since the publication of his 1968 bestseller, The Population Bomb. He is Bing Professor of Population Studies Emeritus and President of the Center for Conservation Biology at Stanford University. Ehrlich is a member of the National Academy of Sciences and a recipient of the Crafoord Prize. Mouth breathing early on is the impetuous of a wide variety of health issues.